RCA Radiotron Model Vacumn Tube, made in USA. 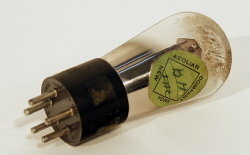 Tube type = UY227. Sticker reads "Aeolian Company New York".